Come talk about them using the #CountdownYA hashtag from 8 - 9 pm on Monday 29th June - all welcome! 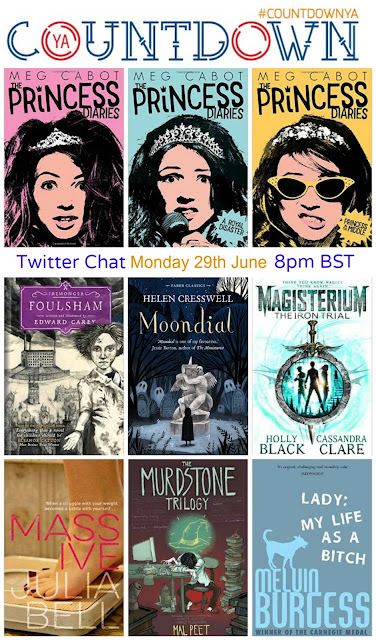 We're hoping some of the authors coming out will pop in to the chat if possible. The first 15 minutes or so will be looking at covers, after that it will be a free for all of people recommending anything they've already read (BUT NO SPOILERS PLEASE!) and discussing/asking questions about things they're particularly curious about or looking forward to. For what I HOPE is a full list of books coming out next month, check out below graphics. Another year, and another Countdown! 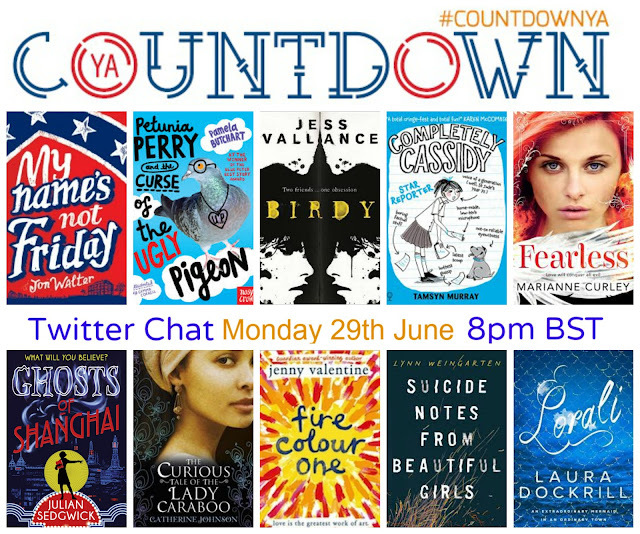 We're celebrating brilliant books coming out on the 7th May (mostly, with a couple the week afterwards.) 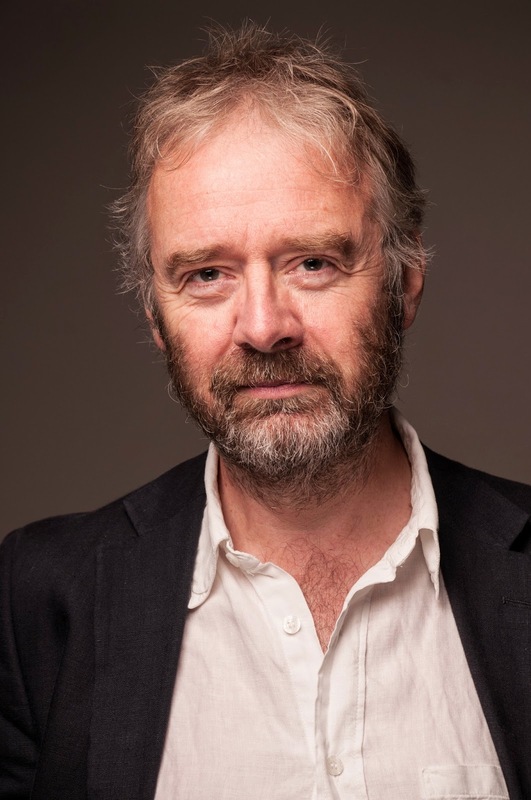 I'm thrilled to kick us off with Paul Dowswell, whose book Bomber is upcoming from Bloomsbury, answering a few questions about it. 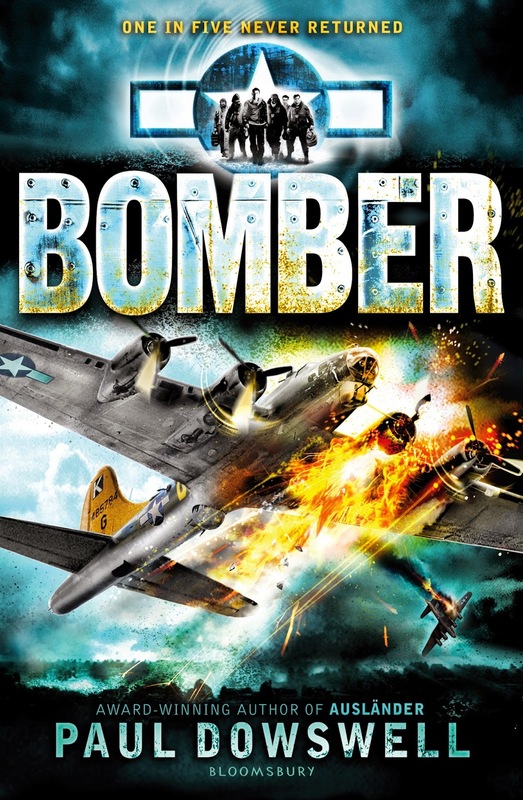 Where did you get the idea for Bomber and how did you research it? My book is about a Flying Fortress crew operating out of East Anglia during the Second World War. 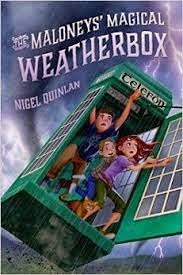 It was inspired by family trips to visit friends who live in a converted pub called The Green Man, in Kirkstead, Norfolk. During the war this pub was frequented by American airmen from nearby Seething airbase. Whenever I visit, I am haunted by the thought of these young men drinking their ‘warm’ beer on the nights before their bombing missions, when many would have been blown to pieces over places like Berlin, Stuttgart or Schweinfurt. I like to walk the same streets as my characters, so where ever possible I visit the places where I set my stories. So last time I went to Kirkstead my friends took me to Seething. It’s an airfield now, rather than an airbase, but the main runway, and the control tower are still there. 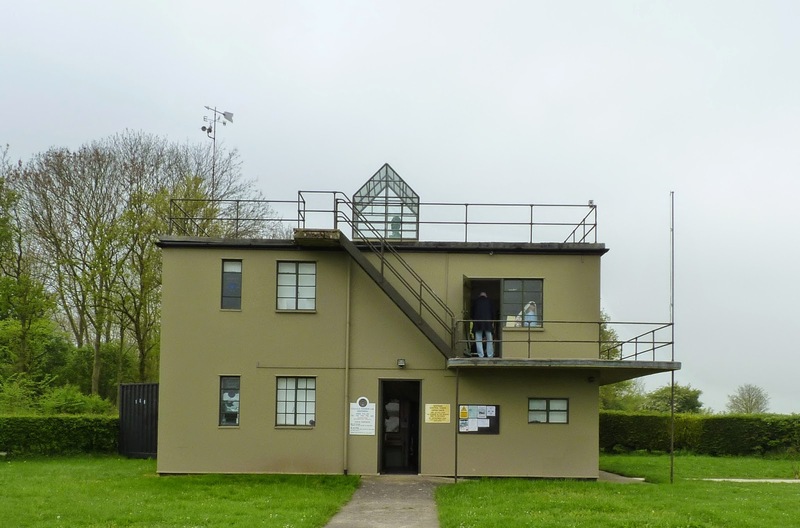 The control tower at Seething in 2014. This is a museum now and it’s open to the public. The view from the control tower during the war. 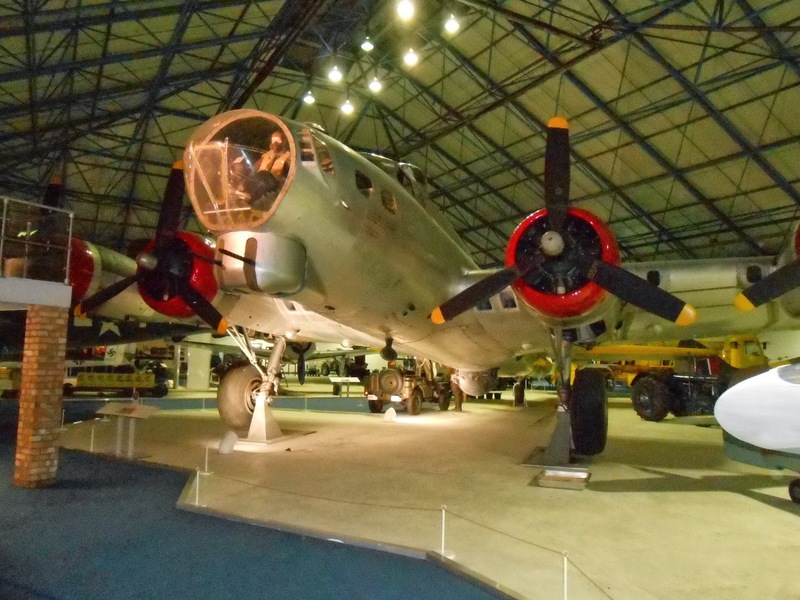 I also went to the RAF Museum in Hendon, London, to spend a fascinating afternoon looking at the Flying Fortress they have there. Paul with the Flying Fortress at Hendon. I watched the 1949 film Twelve O’ Clock High, staring Gregory Peck, to try to get a feel for how American airmen spoke, and also scores of You Tube documentaries and snippets on Flying Fortresses. Most importantly, I read many books about the air war over Europe, and the French Resistance escape routes used by downed Allied pilots. What’s real and what’s made up? When you write historical fiction the question often arises, what’s real and what did you make up? In my story the planes and airbase are at Kirkstead, so that’s all made up, but it’s very like Seething, which was home to Liberator bombers rather than Flying Fortresses. In the story I wrote there are raids on Schweinfurt on August 17, 1943, and October 14, 1943. These are based on actual USAAF raids on that city on those days. There’s also an episode in my book loosely based on the famous story of the Memphis Belle, whose crew were lionised by the American media when they completed their twenty-five missions in 1943. All my main characters are fictitious although I have tried to reflect as accurately as I can the thoughts and experiences of the United States Eighth Air Force crews in 1943, and the extraordinarily brave members of the French Resistance. I often feel grateful I have never had to conjure the reserves of courage required by the characters in my novels. Why did you write about a Flying Fortress? The B-17 Flying Fortress is a fascinating aircraft. Its Art Deco curves make it one of the most beautiful aircraft of the Second World War. Although it had a reputation for toughness and durability, it never quite lived up to its name. Of the 12,731 B-17s built between 1936 and 1945 4,754 were lost in action. Over 1943, when casualties in the air war were at their highest, it has been estimated that a Flying Fortress crew had a one in four chance of completing their 25 mission tour. Not all of the 10 man crew would necessarily be killed, of course, when their plane was shot down. Many airmen parachuted to safety to escape from occupied Europe or spend the rest of the war in a German Prisoner of War Camp, but those are still daunting odds. In the UK, you can see B-17s at Duxford in Cambridgeshire and Hendon on the edge of London. In the United States, there are at least 30 B-17s on display at museums, and several of these are still able to fly in air shows. Thanks Paul for a brilliant opening post! Keep checking back here for the full schedule, updated daily, with tomorrow's post coming from Sarah Mussi at Luna's Little Library. Well, Countdown to 7th August is at an end, and today, you’ll be able to go out and buy all of these fantastic books for yourself! If you've missed any of August's posts, check them out here. 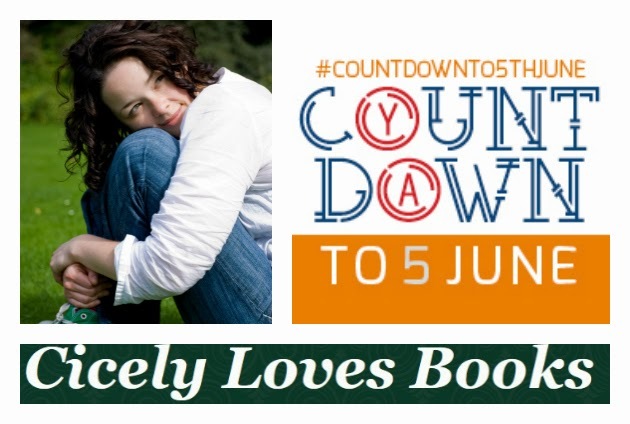 I’ve really enjoyed both Countdown events and want to thank EVERYONE who’s taken part, bloggers and authors alike (and, of course, the fantastic publicists who put me in contact with such brilliant authors!) – and, indeed, all those who’ve spread the word via Twitter/etc even if they weren’t involved. At the risk of offending anyone I’ve left out (I truly don’t mean to! ), particular thanks to Daphne for her amazing graphics and for tweeting when I couldn’t, Keris Stainton, Keren David, Louisa Reid, Michelle, Laura and Debbie who reacted so positively when I first came up with the idea, and gave me some brilliant advice along the way, Sophia Bennett and Jeff Norton for persuading me to do August as well as June and Keris (again!) for hosting the Twitter chat on June 5th while I was teaching my evening class. 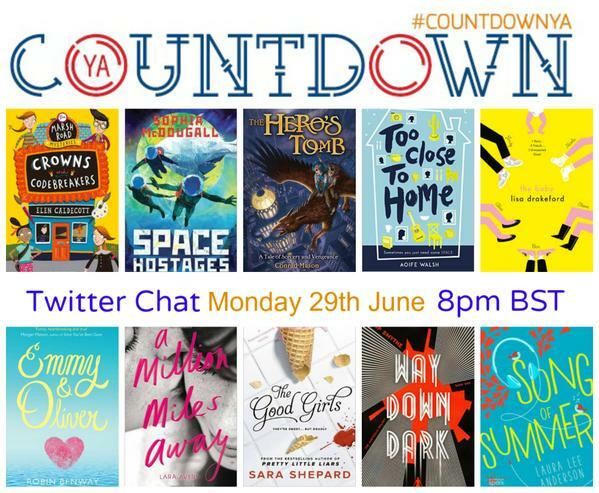 There are no plans for future Countdown events this year (I’ve told Daphne to yell at me if I even CONSIDER trying it again, I need a rest!) but we will hopefully return at some point in 2015, possibly with a different format. Well, we've now passed the halfway point of #Countdownto5thJune (actually, we're quite far past the halfway point, given the delay in this round-up post - sorry!) but the quality is as high as ever, with 7 fab posts last week! On Friday 16th May, Web of Darkness author Bali Rai stopped by The Reader Ramblings to talk about his upcoming book for Random House, and about censorship and diversity. It's a fascinating post which I really enjoyed reading - and there'll be more from Bali on Thursday 29th May, as he's interviewed at Fabulous Book Fiend. Saturday 17th May saw Kim Slater, author of Smart (Macmillan) drop by Queen of Contemporary to discuss the cover design of her gorgeous book. I've just read, and enjoyed, Smart, and the main character's love of LS Lowry plays a big part in the book, so the cover is a perfect homage to the great artist - and Kim talked us through all the decision-making that went into it. 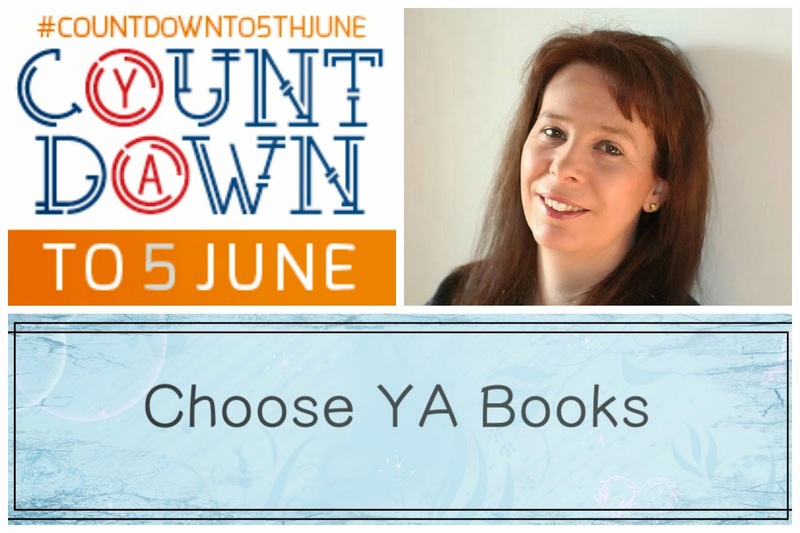 On Sunday 18th May, Helen Grant - always fabulous to talk to - stopped by Choose YA for a superb interview about Demons of Ghent, coming from Bodley Head, about urban exploration, and writing in general. 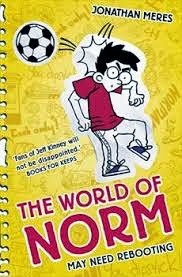 Monday 19th May saw an author from one of my very favourite publishers, Strange Chemistry, appear! 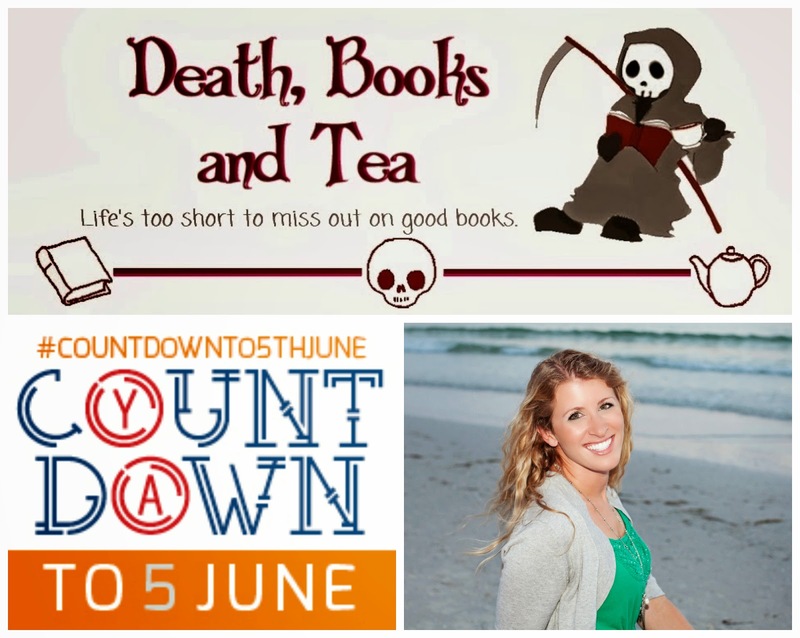 This was a notable interview at Death,Books and Tea, as it was part of not one but TWO blog tours - as well as being in Countdown, Lisa O'Kane kicked off her own blog tour for Essence here. A fab interview; I particularly loved the dream cast and photos! Tuesday 20th May gave us another brilliant interview, as Take Back The Skies (Bloomsbury) author Lucy Saxon appeared on Snuggling on theSofa. I'm not that much of a steampunk fan but Debbie's great questions and Lucy's awesome answers have made even me really excited to read this one! 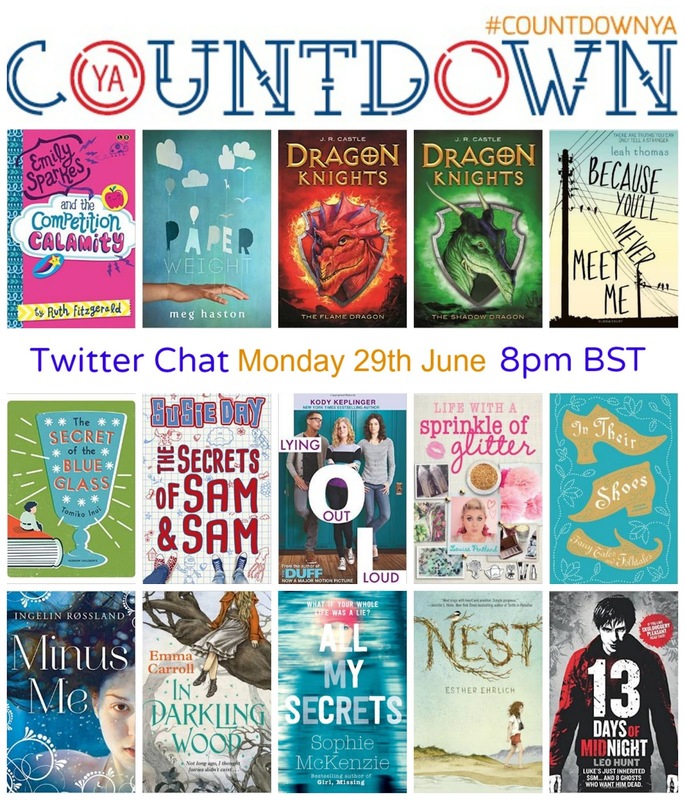 Wednesday 21st May was very exciting for me as the tour headed to my own blog YA Yeah Yeah; I was thrilled to get a chance to interview Natasha Farrant for the second time! I loved talking to her after the paperback release of The Things We Did For Love a few years ago, and it was fascinating to catch up with her and talk about her wonderful Faber and Faber series, the Bluebell Gadsby diaries, since the upcoming Flora In Love was really fabulous. 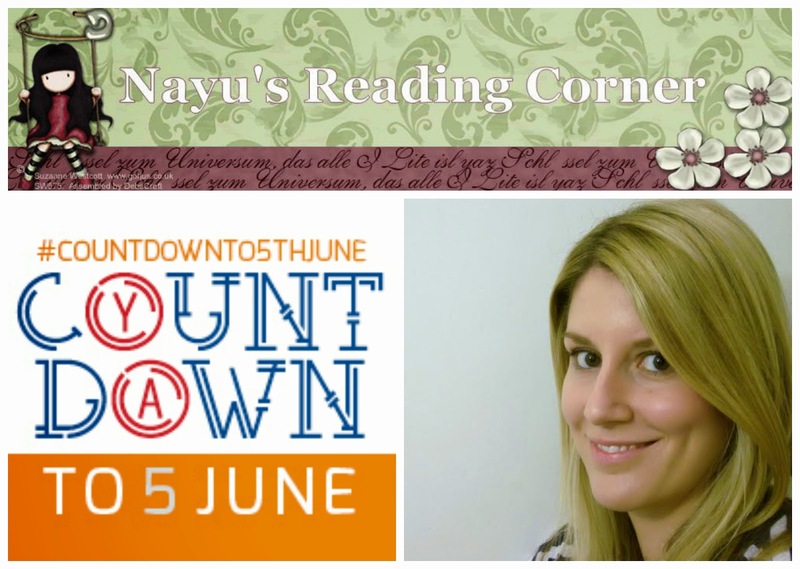 Rounding off the week, on Thursday 22nd May, one of my favourite MG authors, Ellie Irving, was on one of my favourite blogs when it comes to MG books, Nayu's Reading Corner - a perfect match! As well as a great guest post about her research for The Mute Button (Corgi), there's also an ultra-easy to enter competition to win a copy of the book. Check it out! 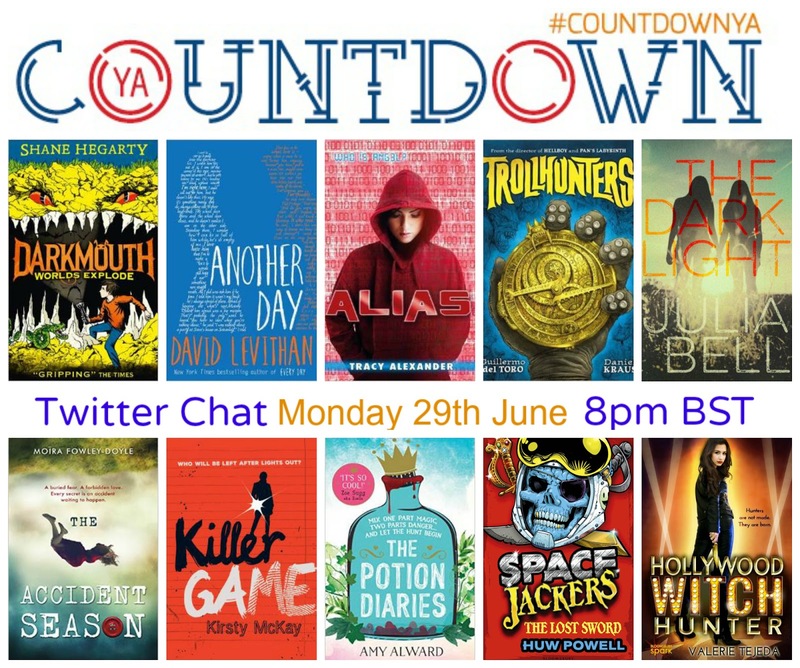 Well, we're nearly halfway through the #Countdownto5thJune tour, and week 2 was just as amazing as our fantastic week 1! 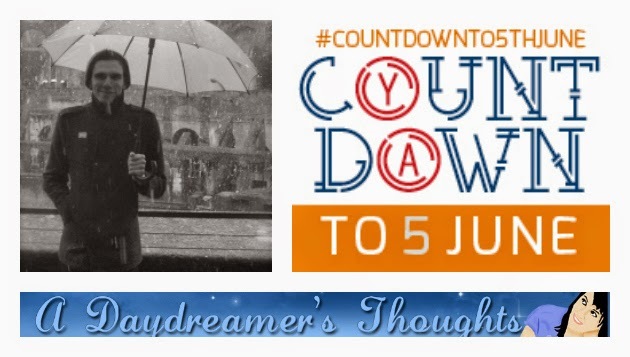 The week got off to an incredible start as we had our first Countdown to 5th June video! 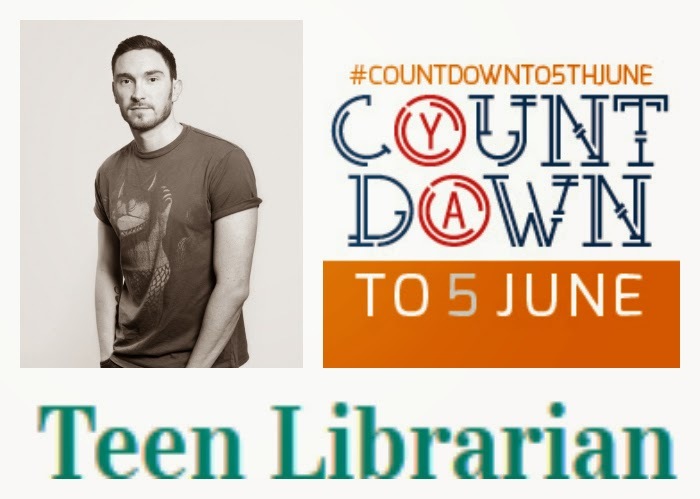 MASSIVE thanks to James Dawson, author of the upcoming Say Her Name for Hot Key Books, for recording this, and Matt from Teen Librarian for setting it up and sending him such brilliant questions. (And, of course, a huge thanks to the pupils at Matt's school who came up with the questions. 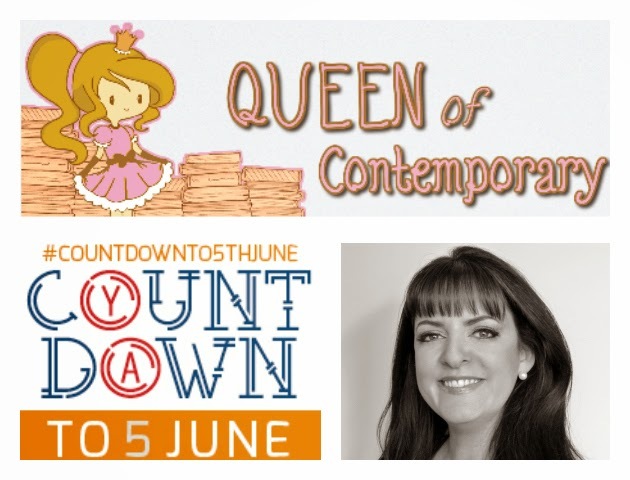 While the website says Countdown YA, we definitely wanted to get some books for slightly younger readers in and Caroline from Big Book Little Book was the perfect person to host an author for this, as BBLB covers a wide variety of ages. Jennifer Grey, author of Faber and Faber's Chicken Mission series - which will start with Danger in the Deep Dark Woods - gave us her this brilliant guest post, a 'call to wings'. 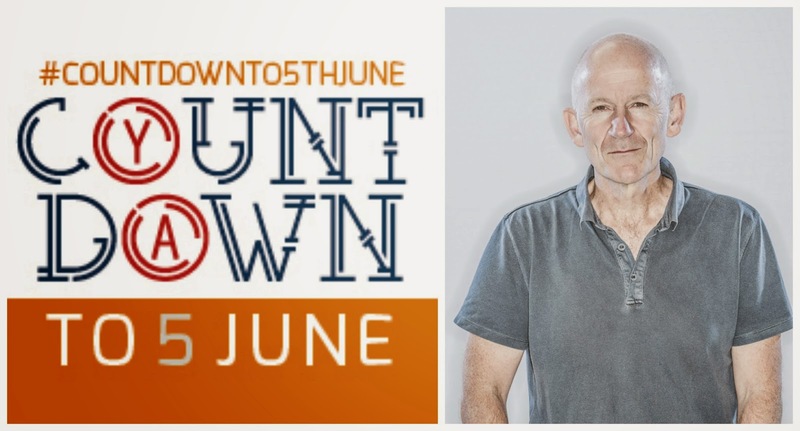 Matt Whyman is, I believe, unique amongst all the participants in Countdown to 5th June because he has not one but TWO books coming out. (Admittedly, he's one of many authors involved in Andersen's short story collection War Girls, while Hot Key's American Savage is just his own work!) 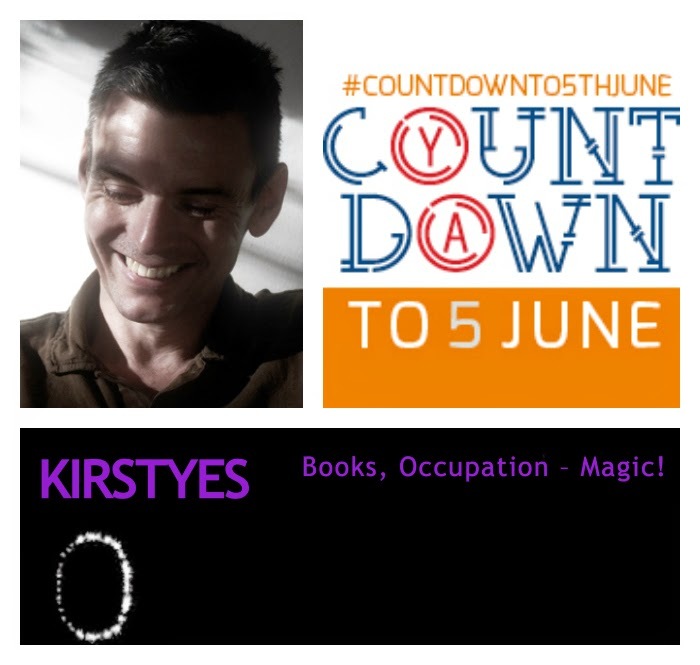 He'll be talking to Countdown graphic designer and co-tweeter Daphne at Winged Reviews on Sunday 25th May, but he dropped by last Sunday to speak to Kirsty at Kirstyes about War Girls. Monday saw another Hot Key author, Nigel McDowell, take part in a brilliant interview with Faye at at A Daydreamer's Thoughts. 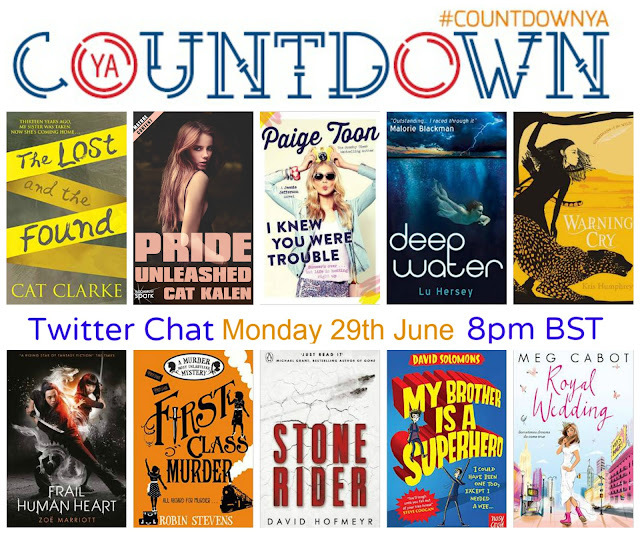 Faye is a real blog tour expert - putting together the fabulous one currently going on for Kim Curran's Glaze (check out YA Yeah Yeah tomorrow for my spot on it! ), and asked some superb questions here. Katy Moran spoke to Raimy - who like last Thursday's participant Sister Spooky is one of the bloggers I've known the longest - on Tuesday. I've been following Readaraptor for several years but this interview, about Katy's The Hidden Princess - coming out with Walker - is one of my favourite that Raimy's done! 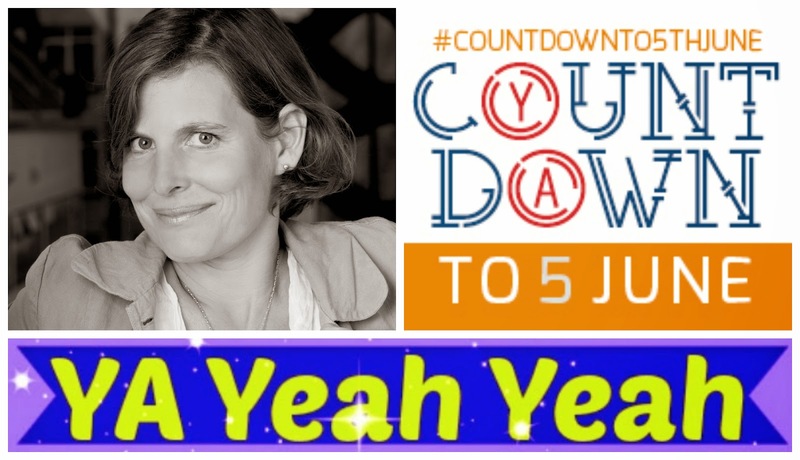 I am spectacularly excited for ALL the books coming out June 5th, but regular readers of my reviews at The Bookbag and on YA Yeah Yeah will know that a series which holds a special place in my heart is Susie Day's Pea's Book series. The lovely Red Fox have just sent me a copy of book four, Pea's Book of Holidays, and it is taking all my willpower to finish this post before reading it - especially after Susie's amazing interview with Cicely of Cicely Loves Books somehow got me MORE excited! Finally for this week, we have the only book that's already out! I own a gorgeous hardback of Keren David's Salvage but it's such a brilliant read that I'm STILL going to be tempted by the paperback when it's released on 5th June! 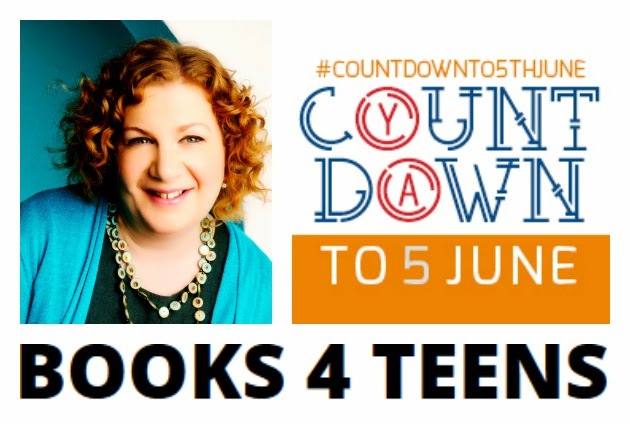 She took part in a superb interview today with Jesse of Books 4 Teens. Thanks again for taking part, everyone!